I run a group of moms who would definitely take advantage of this program. I love when us as parents can find the information we need without wanting to rip our hair out! This is my first time hearing about this program and I am going to peruse. 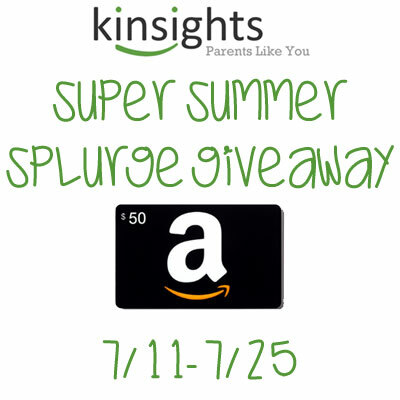 Come enter the Kinsights $50 Amazon Gift Card #Giveaway. Share with friends too! Parents, are you looking for an easy and efficient way to stay on top of your kiddos’ health needs this summer and beyond? Kinsights.com offers a unique online community for parents that makes getting great parenting advice easier and smarter. Whether you need tips on fun outdoor family activities, insight on the best sunscreens for your little ones to use at the beach, or ideas for a “fun in the sun” birthday party, Kinsights is a must-have summer tool for all parents. Parents often get the most useful advice from each other, and Kinsights makes direct connections to nurture this communication. Also, Kinsights works in a way that answers are voted on by community, so the best, most helpful content rises to the top. Kinsights also offers an online Pediatric Personal Health Record Keeper for parents. Gone are the days where you’re being held responsible for keeping track of slips of paper or lugging files and folders containing your children’s health information. And in the event of an emergency, you can even have the health records sent to the ER or out-of-town doctor in a snap. This is especially helpful when your child is at summer camp or you’re on a family vacation and need medical treatment. You can organize your child’s growth and developmental milestones, immunizations, medications, allergies, and more. This tool is amazing and a godsend to parents. Connect with Kinsights at their Kinsights.com to learn more and sign up! I would buy a few new books and maybe an essential oil I've been wanting. Thanks for the chance!!! I would get a baby gift for my sister who is due Monday. I'd probably use the giftcard towards school supplies. I would use the gift card for a new cast iron griddle for making breakfasts for my family. A skillet is just too small. I am saving up for a 5th gen iPod for my car. I'd get my youngest a birthday gift. She'll be 1 next month, so I'd get her a Elmo gift. I would add it to my "bank" for a large purchase in the future. i would get my two children a few things for school like a pair of jeans and a shirt ! A great place to buy my printer's inks; as I have before.